Opuntia engelmannii (including O. gregoriana) is a common and large prickly pear. It has been confused with other large cactus species such as O. valida, O. discata, or O. orbiculata. O. engelmannii prickly pears are 80-150 cm tall. In mesic conditions the cactus can be taller. They are generally the largest (tallest) wild prickly pears from the Rio Grande River to California. This Opuntia is upright with spreading branches. O. engelmannii has variable pads that are generally obovate, broadly elliptic, or orbicular. Pads may be 20-30 cm long and 15-25 cm in diameter. Under optimal conditions the pads of this Opuntia grow thick and heavy. The cladodes of O. engelmannii are pale-green and tend to stay that color year round unlike many opuntias that may have pink or purple pads in the winter. Spines are carried in the bird’s foot pattern and are chalky white, brown, tan, or even dull yellow–they darken considerably at the base. Some spines curve, but some may be perpendicular to the cladode surface. There may be as few as 1-2 spines or as many as 6 spines per areole. Radials may be present in mid-stem and upper stem areoles, 0.35-1 cm long, acicular. There is much spine variation in O. engelmannii, but one pattern is common. The thick spines are distributed over most areoles except the lowest. There are at least 3 spines splayed in a “bird’s foot” pattern. However, areoles with 2 or 4 (or even 5) spines are not uncommon, and weakly spined individuals also occur. The glochids of this Opuntia (and O. lindheimeri) are distributed in a distinctive pattern. They either circle the areole or are spread throughout the areole and are not generally arranged in a tuft. This is especially true of mid-stem areoles. The glochids are not densely crowded and are of unequal lengths, 3-5(9) mm. The flowers of O. engelmannii are clear yellow without red centers. Orange venation may be observed on inner tepals on close examination. The yellow color in this Opuntia is not as brilliant as in O. lindheimeri. The large flowers are 7-8 cm in length and diameter. The filaments are cream-colored to pale green and 1-2 cm long. The style is cream-colored and the stigma lobes are green. The pericarpel is typically about 5.5 cm long and 3.2 cm in diameter. Scattered circular areoles with tan hairs and bristle-like glochids project from all parts of the pericarpel areoles. Fruits of this Opuntia are deep purple, reddish–purple, or dark beet-red, and older fruits can be very dark. The barrel-shaped fruits are 5.5-8 cm long and 3.5-5 cm in diameter. Alternately the fruits may be of the same size but oval or obovate instead of barrel shaped. The fruits do not have an obvious narrowing or neck. The fruit pulp is dark red, very juicy, and very sweet. 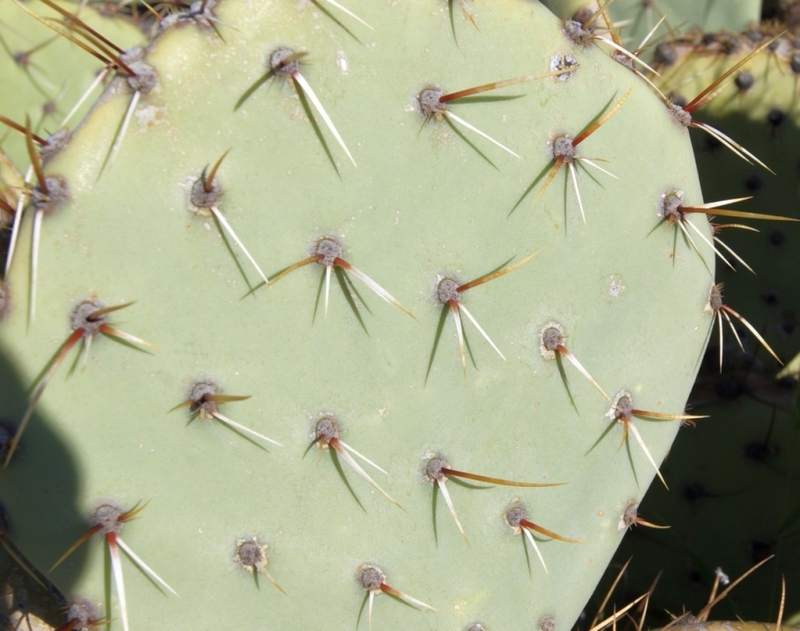 The generally spineless fruits of this Opuntia may have slender spines 5 mm long in some upper areoles. The seeds are small (2)3-4 mm in diameter and numerous, and they have a narrow hilar notch and a narrow beakless aril margin. O. engelmannii and O. lindheimeri are related. See the checklist of differences between O. engelmannii and O. lindheimeri. Read the original description. O. engelmannii is hexaploid. O. engelmannii can be 3 to 6(8)-ft wide and up to 6-ft tall. Plants in northerly locations or at high altitudes are smaller. The pads are typically egg-shaped, obovate, oval, or sometimes circular. Cladodes are green or or sometimes barely blue-green, but are seldom dark green. Pads may even be yellow-green when stressed. Areoles generally have (1)3 to 5(6) spines that are often off-white, tan, brown, or even pale yellow. The spines typically darken towards the base to a true brown (not red-brown) or even black, and they often fade to gray with age. Spines are variable, but generally less than 2 inches long and chalky appearing. Less-spiny-than-usual O. engelmannii plants in southeast, NM and near El Paso, TX have been called O. gregoriana but are considered synonymous with O. engelmannii herein. O. lindheimeri was described as a variety, but we accept it as a species herein. O. engelmannii ranges wide and far and there may be Opuntia types that might be considered varieties but which have not been validly described.